Fine art, a traditionally opaque and fragmented market, is now more transparent and democratic than ever before. As fine art sales soar, buyers and sellers are also becoming more familiar and comfortable with art sales’ slow but steady digital migration. Join us for more than 700 lots of fine art featuring many different artists. Bernard Buffet, one of the many artists featured in this auction, was born in 1928, France. He was an exceptional French Modernist painter. 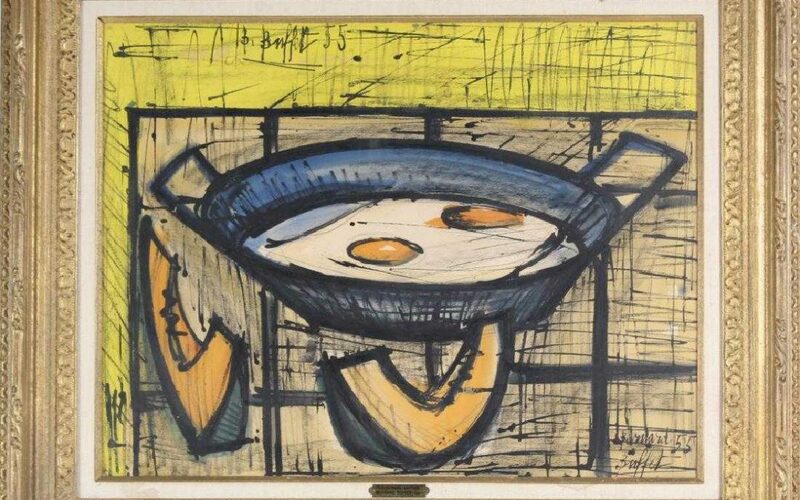 Lot #1 estimated at $15,000-$25,000 is an original watercolor on paper titled “Nature Morte Aux Oeufs Sur Le Plat”. Frank Stella, an American fine pop artist was exclusively commissioned to create the featured icon image for The New York Metropolitan Museum of Art Centennial Celebration from 1969 to 1971. This monumental installation piece is Lot #2, titled M11, estimated at $2000 to $5000. Another listed artist featured in this auction is Donald Roller Wilson, an American surrealist who paints wild, comical, and often mystical eccentricities. Lot #254 is a beautiful oil painting of a female ape in a white dress and a flower crown that exhibits Wilson’s imaginative mind estimated to sell between $15,000-$25,000. Heather Nevay, another talented surrealist artist, uses symbolism to express ideas of heroism, weakness, fear and the shifting balance of human relationships. Lot #251 depicts three colorful portrait images with a mystical creature, titled “A Fork in the Road”, estimated between $1,800-2,200. Antique 19th century painter Mauritz Frederik Hendrick De Haas, 1832-1895, was one of the most famous marine and landscape artists of his era. Lot #164 is the perfect example of Haas’s exquisite ability to portray lifelike seascapes transcending the viewer into another reality. Estimated to sell between $2,000-5,000. Not only does Fine Art for the Beholder feature different styles of paintings, it also includes sculpted and blown glass. Paul Stankard is an American master glass sculptor, Lot #114 “Bouquet Cube D7” is arguably one of Stankard’s most beautiful masterpieces. This amazing piece depicts stunning technical work with an amazing floral bouquet center, estimated between $2,000-$5,000. Lot #122 sculpted by Czech Republican Michael Pavlik, born 1941 is a stunning work of contemporary glass titled “Three Triangles Inside the Spiral with Yellow and Red”, estimated between $3,000-$6,000. This piece was originally purchased Habatat Galleries. Dale Chihuly was born in 1941 and is one of the most famous American glass blowers to date. Lot #123 is a wonderful example of this extraordinary series, a radiant orange persian set with Supreme blue lip wraps, each piece hand blown and outlined in blue. Estimated $6,000-$9,000. Hand painted studio art pottery is another facet of fine art that is explored in this auction. Jean Cocteau, 1889-1963, was a French Modernist. Lot #147 is a art pottery charger plate decorated with three eyes and two faces, appropriately titled “Les Trois Yeux” (The Three Eyes), estimated between $1,000-$3,000. Guaranteed to be authentic. Don’t miss Hill Auction Gallery’s Fine Art for the Beholder auction on September 26th 2018. Register early to bid and preview the catalog today for more exquisite and unique fine art from all different mediums and techniques.